What time should we leave out trash bins on our pickup day? We suggest you leave your trash bins out the night before your pickup day, because pickup times can vary. 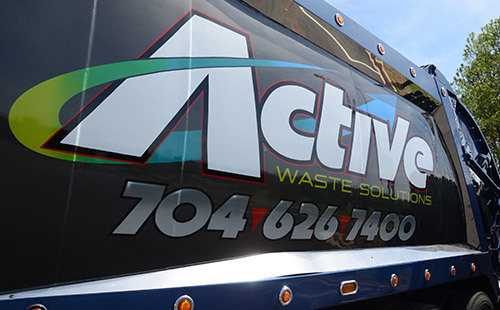 If you must wait until the day of your pickup, Active Waste requests that your bins be ready by 6 a.m.
We are in the process of setting up an online payment system. In the meantime, you can call Active Waste’s office to arrange payment by credit card. The list of what can and cannot be recycled is vast. Please visit our Recycling page for details. Does Active Waste Solutions serve my neighborhood? Our Areas & Schedules page outlines the counties in North Carolina and South Carolina that we serve. Can Active Waste dispose of paint, chemicals, or yard waste? You can call to arrange yard waste pick up. We do not accept paint or chemicals. They can be disposed, free of charge, at Foxhole Recycling Center and Yard Waste - 17131 Lancaster Highway, Charlotte, N.C.
Is there a charge for bulk items such as furniture, appliances and rugs? There is a charge to remove a bulk item, and the cost depends on the type and size of the item. You would need to contact our office to schedule the pickup. What types of trash can be thrown away in Residential bins? Regular household trash is fine to throw away. We cannot pick up construction materials or yard waste in our residential bins. For additional service or dumpster rental, please contact our office.